Homemade Tomato Basil Marinara Sauce is hearty, flavourful and loaded with fresh, seasonal ingredients like roma tomatoes, basil, oregano and thyme. It makes the perfect topping for pizza, meatballs or pasta dishes, and it comes together quickly. Just chop, simmer and blend! In a large pot, heat the oil and add the onion and garlic. Sauté for 10-15 minutes, or until onions have softened. Add the remaining ingredients to the pot, and stir to combine. Simmer on low for 35-40 minutes, or until the veggies have softened and the mixture has stewed together. Be sure to stir the mixture occasionally to ensure it does not burn onto the pot. Remove the pot from heat and carefully lift out the sprigs of thyme and discard. 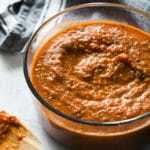 Using a handheld blender, blend the mixture until a thick sauce forms. For a thinner sauce, keep blending or add a splash of wine or vegetable broth. Store in an airtight glass container in the fridge, and use within 4-5 days. If you don’t have a handheld blender, you can use a regular blender. Just be sure to let the mixture cool slightly before doing so, as not all blenders will be able to withstand the heat. Also, be careful not to over-blend the mixture as it may get too thin.